Mera Woh Matlab Nahi Tha, the title of the play says it all! 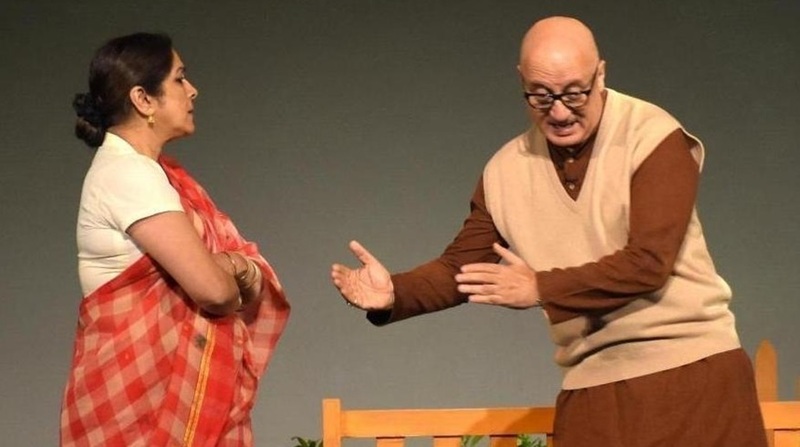 A tale of two hearts brimming with love, even after a separation of 35-long years; the play is a simple, yet emotional ride of the protagonists Pritam (Kher) and Hema (Neena Gupta). The story revolves around former lovers, who meet after years and try to figure out why the other one pulled themselves back from the relationship. They are seen sitting on a bench in a lawn, waiting for each other to clear the doubts. With a young affair that ignited fire between the two, they were separated by parents. Although, they tried to connect through letters, but all their efforts went in vain, leading them to overcoming each other over the years. Hema is quite vocal about her life, thoughts and family; whereas, Pritam is reluctant to share details about him. However, as the story moves further and Hema divulges shocking details about herself; a moved Pritam is seen lending his former lady love a shoulder. They take each other into flashback, to explain all that had happened with them all these years. They discuss about their spouses, families and children. Learning some appalling realities about each other’s families after narrating their side of stories, Hema and Pritam realise that the bond and intimacy still remains. The misunderstandings start to fade and their hearts melt on learning the hardships each of them went through. Pritam is shown as a fickle-minded person initially, who doesn’t know how to put forth his thoughts, therefore, keeps mentioning “Mera Woh Matlab Nahi Tha“. On the contrary, Hema is clear in her mind and keeps pushing Pritam to let himself lose, and tell her what made them drift apart. An adolescent affair of Hema and Pritam, the story has been beautifully scripted and narrated. Neena Gupta is stupendous as she slips into the skin of two characters with such ease. The 110-minute play is a two-day conversation between the former lovers. Writer-director of the play Rakesh Bedi is an additional charm. His omnipresence offers some quirky moments, letting the audience gulp down their high-end emotions. Anupam Kher, who takes the centre stage perfectly, defines a lover, father and a doting husband. The set is simple looking, yet attractive. A wooden bench with a backdrop of Lodhi Garden, Delhi is placed in the centre of stage. Second half also shows a small portion of Pritam’s house. Not much has been left to imagination, as the flashback is played in the form of film footage on a screen placed behind the sets. The play which deals with issues like parental and societal pressures does not leave the audience heavy hearted. Rather, the beautiful ending, gushes the flow of happiness and contentment in audience. The play received a thunderous applause after Anupam Kher ended it with a soliloquy.